The company I found on this site was very good. Deskjock is one of the UK's favourite consumer review sites packed full of exciting features and special offers giving you a real insight into transparent customer services and improved client relationships. 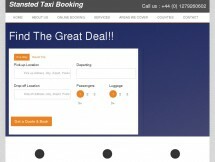 Our customer feedback and product integration to let you make an informed decision about stansted taxi booking.